Transparency Market Research (TMR) has published a new report titled “Shock Wave Therapy Device Market - Global Industry Analysis, Size, Share, Growth, Trends, and Forecast, 2017–2025”. According to the report the global shock wave therapy device market was valued at US$ 91.6 Mn in 2016 and is projected to expand at a CAGR of 5.0% from 2017 to 2025. The report suggests that increase in number of bone injuries and rise in demand for chair time optimization is projected to boost the shock wave therapy device market during the forecast period (2017 to 2025). North America and Europe are projected to dominate the global market owing to increase in adoption of shock wave therapy device for treatment by orthopedic doctors and patients. The market in Asia Pacific is projected to expand at exponential CAGR during the forecast period. Growth of market in Asia Pacific is attributed to large number of private clinics and hospitals, rise in the number of geriatric population requiring physiotherapy services after bone surgery, and increase in adoption of sports activities among the youth. The market for shock wave therapy device in Latin America is likely to expand at moderate growth rate during the forecast period. 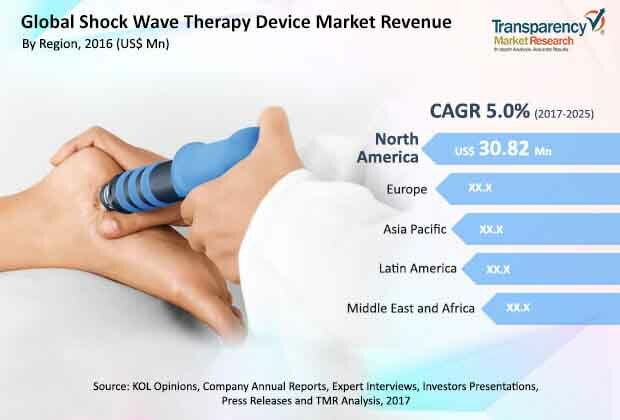 The global shock wave therapy device market is projected to be driven by value added features offered by various shock wave therapy device companies to streamline the day-to-day work flow and increase revenue of practices. The shock wave therapy device provides a wide range of features and benefits from patient pain healing remedies to treatment procedures at varied frequencies. These features help physicians and nurse to streamline physiotherapy activities required for the patients to maintain their daily routine efficiently and effectively. Key players offering shock wave therapy devices are coming up with value added features such as effective probes, sensors, ultrasound devices, laser connectivity, effective modality features, and imaging modules, thereby reducing the overall operating cost and improving the effectiveness and efficiency of physiotherapy. These companies are focusing on developing combined shock wave therapy facilities in their system to effectively integrate therapy or treatment procedure along with imaging tools such as cameras, digital radio-graphs, high sensors, and patient education & awareness programs. These value added features save operational time of physicians and help improve pain management performance. Focused shock wave generation based technology is commonly used in the pain management therapy. This technology is associated with electromagnetic, electrohydraulic, and piezoelectric methodology. Price of this technology is based on perpetual license model. The radial or ballistic shock wave generation technology enables the usage of shock wave therapy device in low frequency clinical applications. This allows healing of extreme pain in musculoskeletal structures and assures 90% recovery. These attributes are likely to propel the segment during forecast period. Radial or ballistic shock wave generation based technology addresses specific challenges faced during the treatment procedure due to its low frequency shock wave therapy. The radial or ballistic shock wave generation technology provides pain relief, increase in range of motion and muscular strength in patients who have undergone bone injury. The report offers detailed segmentation about applications of shock wave therapy device into orthopedic, cardiology, erectile dysfunction and urology. The orthopedic and urology segment is expected to account for a leading share of the market during the forecast period (2017-2025). High share of the orthopedic and urology segments are attributed to rise in orthopedic surgeries, prevalence of kidney stones among global population, and increase in demand for lithotripsy by physicians and patients contribute to the high market share of the orthopedic and urology segments. Furthermore, availability of various reimbursement and Medicare benefits for patients for the treatment of diseases is projected to propel the orthopedic & urology segments. The hospitals segment accounted for a leading share of the global shock wave therapy device market. It is estimated to gain market share by the end of 2025. The segment is expected to expand at a CAGR of more than 5% during the forecast period. Expansion of the specialized pain management service, increase in number of orthopedic patient footfall in hospitals, and adoption of digital platforms for marketing pain management practices has contributed to the dominant share of the segment. Increase in number of multinational hospital chains and high digitization budgets are likely to drive the hospitals segment during the forecast period. High prevalence and incidence rates of bone injuries and kidney stones and increase in number of cases of erectile dysfunction across the global has increased patient flow to clinics. These factors are expected to fuel the clinic segment between 2017 and 2025. North America and Europe accounted for a major share of the global shock wave therapy device market in 2016 and are likely to gain their share by 2025. High adoption of digital platforms for pain management, rise in health care budgets, and government initiative to promote minimally invasive surgery techniques have contributed to the dominant market share of these regions. Asia Pacific is projected to be the most lucrative market, with highest attractiveness index. The market in the Asia Pacific region is projected to expand at a CAGR of over 6% during the forecast period. Expansion of the market in the region is due to large number of clinics in emerging countries such as India and China, well established health care facilities and high adoption of digital health care technology in countries such as Japan, Australia & New Zealand, Malaysia, and Singapore. Market in Latin America is anticipated to expand at a moderate growth rate during the forecast period. Key trend of research and development among the leading Players to Increase Geographic Presence has been observed in last few years. The report also provides profiles of leading players operating in the global shock wave therapy device market. EMS Electro Medical Systems S.A., BTL Corporate, Dornier MedTech GmbH, and Zimmer MedizinSysteme GmbH are some leading players operating in the global shock wave therapy device market. These companies are engaged in increasing their geographic presence through strategic acquisition and collaboration with other leading players. In October 2017, Dynatronics Corporation partnered with Zimmer MedizinSysteme GmbH (Zimmer) for exclusive distribution of select therapy equipment in the U.S. Other prominent players operating in the global shock wave therapy device include Siemens AG, Boston Scientific Corporation, ?NCELER MEDICAL LTD, and Guangzhou Longest Science & Technology Co.